This section provides a tutorial example on how to use the javax.swing.JMenu class to create multiple menus and how to add them to the menu bar. Sub menus and menu items added to a menu will be listed vertically when the menu is selected. Multiple menus can be added to a menu bar. 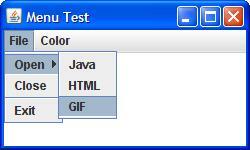 The "File" menu and the "Color" menu are added to the menu bar in this example. A menu can have a child menu included in the same way as a menu item. The "Open" menu is added as a child menu to the "File" menu in this example. Calling the addSeparator() method on a JMenu object does add a separation line in the menu element list.